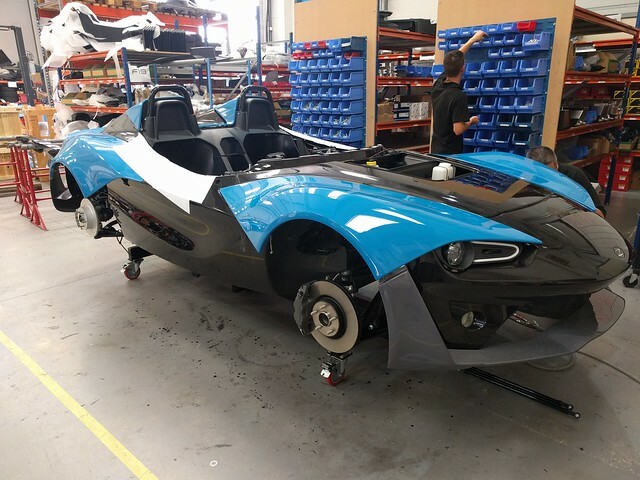 During our our trip to the UK as part of the 2016 GGLC UK Lotus Trip, we were able to get a tour of the Zenos factory in Wymondham. If you havent heard of it before, Zenos Cars was founded in 2012 by Ansar Ali and MarkEdwards who had both spent time at Lotus and Caterham. I was lucky enough to attend the US unveiling of the Zenos E10S and was very impressed with what I saw. It struck me as an equivalent of the Lotus 211 and had significantly better fit and finish than the average Caterham I have seen in the US. 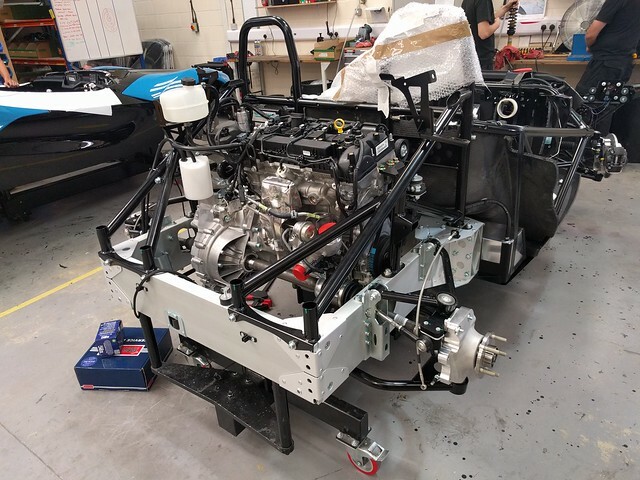 Zenos hates the term “kit car” and stresses that they build the whole car but the reality is that to sell in the US they have to follow the Caterham model and sell them as kits which essentially work with only one specific engine. 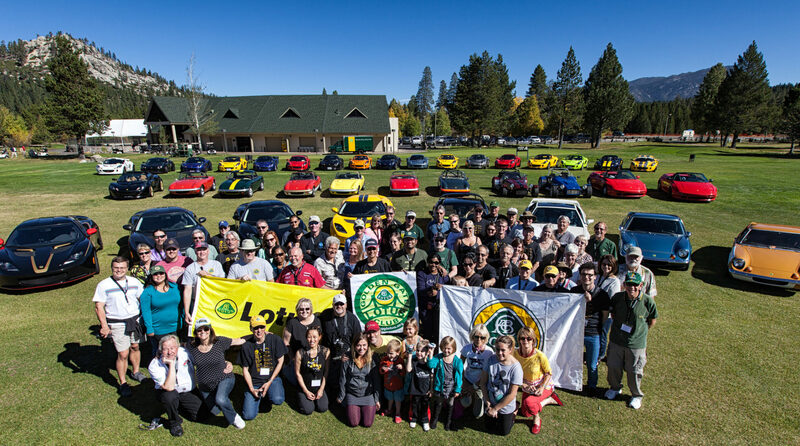 There are a bunch of reviews on the web for folks who want more details of the cars themselv es but I wanted to talk about the factory tour itself. We were lucky to have their Operations Director Matt Windel give us the tour and they were extremely open to having the 15 of use traipsing through the shop. There were a couple of things they asked us not to photographs but other than that we had full access. 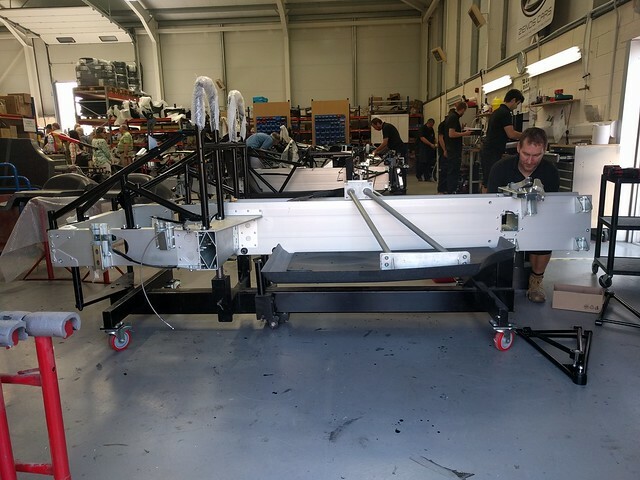 We start off at Station 1 where they essentially build the base chassis by mating the various subframes. 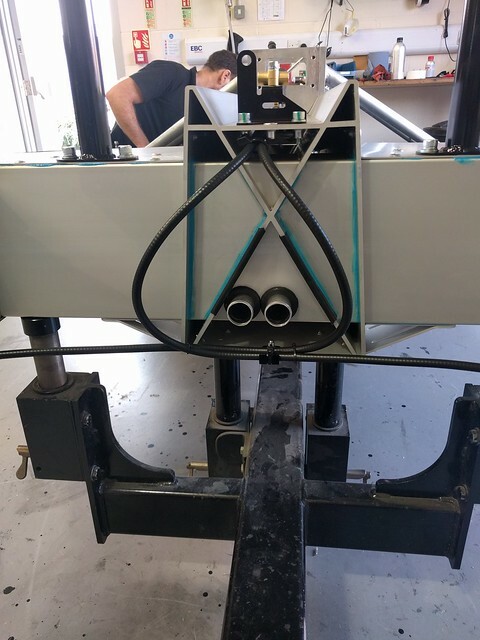 As you can see below, the chassis has an extruded central spine that has a rear subframe bolted and bonded to it. 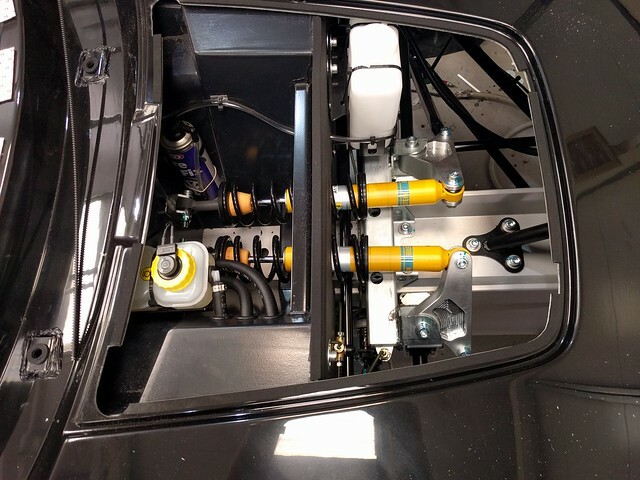 The spine leads to great rigidity in the chassis and is also used to carry both wiring and coolant similar to the side sills of the Elise. 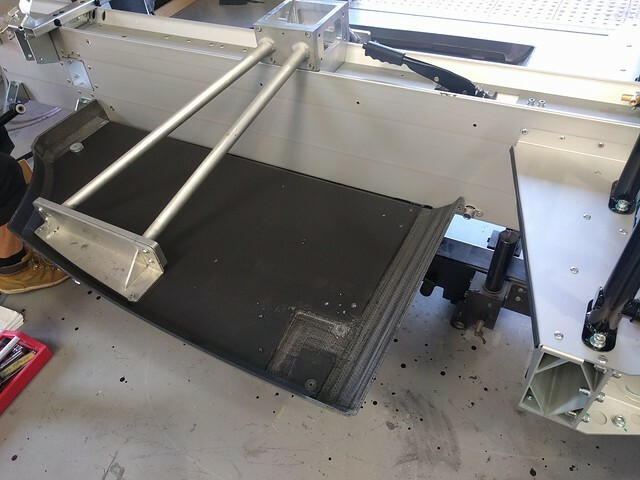 This is also the step where a jig is used to attach the carbon fiber floor pan which is the first part of the carbon “tub”. They use an innovative process to create panels from recycled carbon fiber and drinking straws to form a honeycomb like structure which had 90% the strength of virgin CF at around 10% the cost. This is what allows them to sell essentially a carbon tubbed car for ~$50,000. 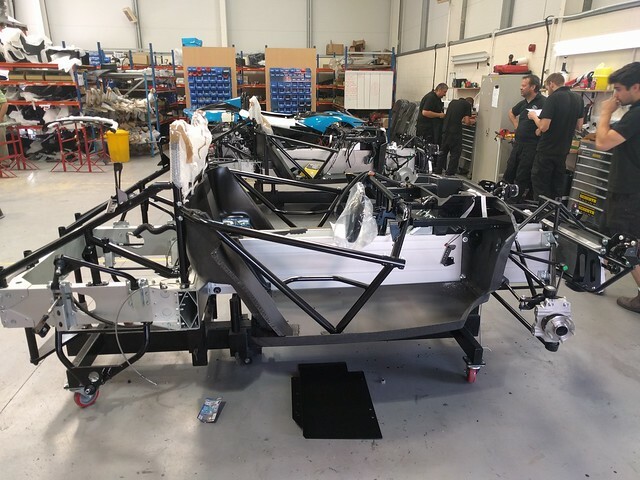 At Station 2 the cars receive the rest of their carbon tub along with the front suspension. The tub integrates side impact tubing which is hidden inside the body and leads to the clean looks of the car. I also like the very Lotus-like design where a single front bracket holds the radiator, lights and front bodywork. They have tried to minimize the part count in general which results in the same part often performing multiple functions. I also like that the front suspension is designed to be sacrificial and a simple shunt will not write-off the entire chassis. Station 3 is all about engine installation. The Zenos uses variants of the Ford Ecoboost engines that range from 200 bhp all the way to 350bhp in the range topper. This guarantees that the engine parts will be very easy to find worldwide though they do use their own locked ECU which is less than ideal for the US market since it will make it harder to use the full range of Ecoboost aftermarket products. At Station 4 it really starts looking like a real car with the rest of the body going in as well as the installation of the adjustable inboard front shocks. The car then goes through the alignment process and a final quality test before being readied for deliver. 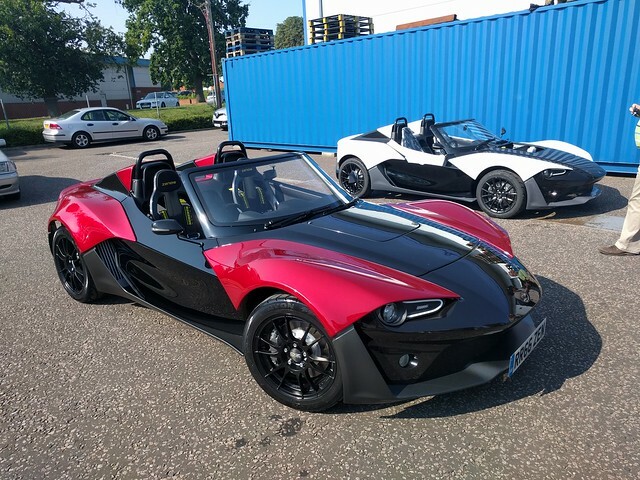 This beautiful custom painted E10R is the 100th Zenos produced and was to be delivered to the lucky owner the next day. My thanks to the Zenos crew for talking the time to walk us through the factory floor and answer all our questions. The Zenos is a very impressive car and the closest you will come to a street legal 211 in the US. If this has piqued your interest you should head over to the Zenos Cars North America website and see what cars they have available.